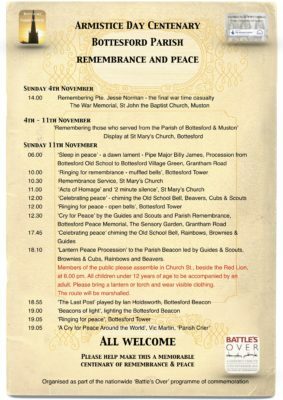 To mark 100 years of remembrance and tribute since the signing of the Armistice on the 11th November 1918 the Bottesford Parish Council and the Bottesford Parish 1st World War Centenary Project are planning a series of memorable events. 18.10 ‘Lantern Peace Procession’ to the Parish Beacon led by Guides & Scouts, Brownies & Cubs, Rainbows and Beavers. Members of the public please assemble in Church St., beside the Red Lion, at 6.00 pm. All children under 12 to be accompanied by an adult. Please bring a lantern or torch and wear visible clothing. The route will be marshalled. These all begin at 6am with over 1,000 lone pipers playing ‘Battle’s O’er’, a traditional Scottish air played after a battle, outside cathedrals and other individual locations throughout the country and overseas. At 6.55pm buglers will sound the Last Post at more than 1,000 locations, where at 7pm First World War Beacons of Light will be lit in a tribute signifying the light of peace that emerged from the darkness of four years of war. Also at 7.05, more than 140 town criers will perform a specially written Cry for Peace Around the World, the first of them in New Zealand and then across the globe through the various time zones. In Bottesford we have adapted this programme to include a recreation of chiming the recently refurbished Old School Bell. This was rung vigorously by school pupils when the Armistice was declared on the 11th November 1918. Members of the Guides, Brownies, Rainbows and Scouts, Cubs, Beavers will recreate this ‘vigorous’ bell chiming. In addition we have organised a community Lantern Procession to be led by Rainbows, Brownies, Guides, Beavers, Cubs and Scouts from the Old School on Grantham Road to the Beacon, Beacon Hill. The Parish Beacon will then be lit. Local trumpet player, Mr Ian Holdsworth, will sound the last post prior to the lighting the Parish Beacon. Vic Martin will act as the ‘Parish Crier’. In the Great War news was broadcast by the Parish Crier. The Guides and Scouts will also join together in young person’s ‘Cry for Peace’ at 12.30 at the Bottesford Peace Memorial on Grantham Road. 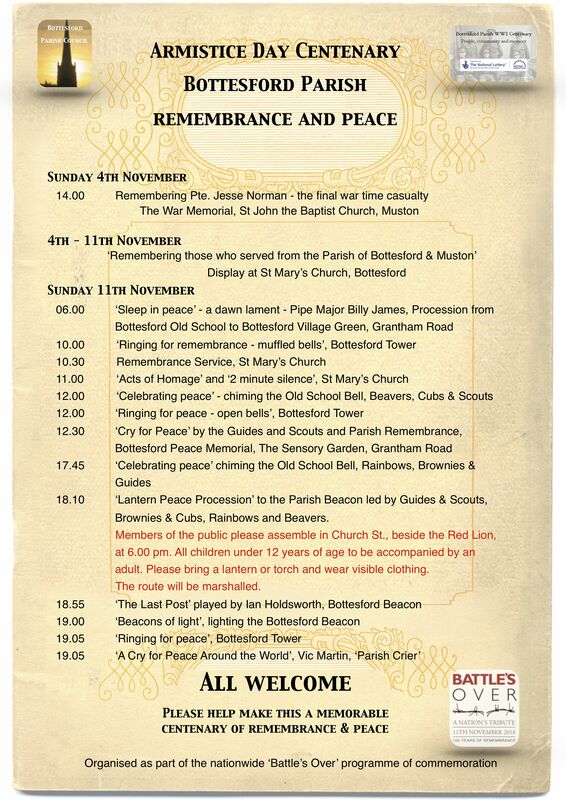 Other community organisations assisting with these events include: The Vale of Belvoir Lions who are marshalling the Lantern Procession; Bottesford Football Club; Bottesford Bowls Club; St Mary’s Church; Bottesford Chapel and Bottesford Bell Tower.